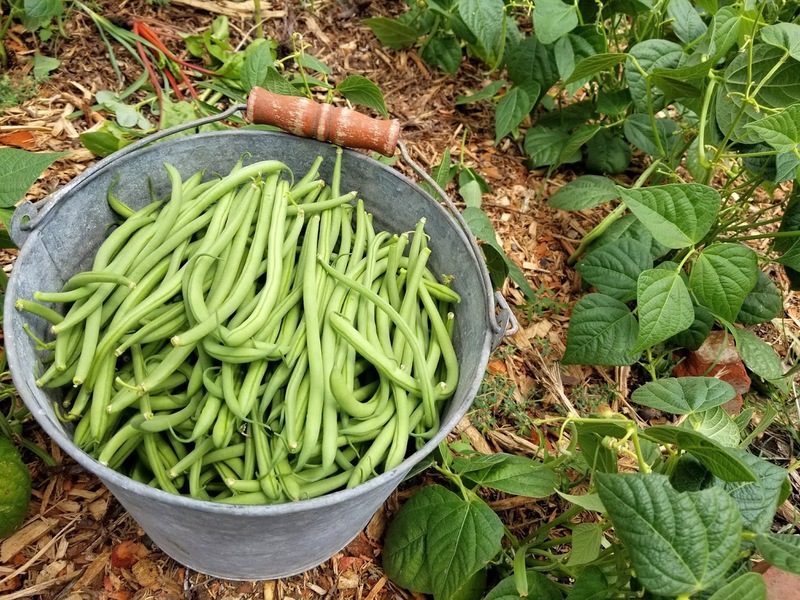 LA Garden Blog : Buckets of Beans! I've got three gallons of fresh green beans to give away. "How'dja know it was three gallons?" a friend of mine asked. "It's easy; see that bucket? It's a three gallon bucket and it's pretty full!" green beans. That's three gallons of beans in my book! 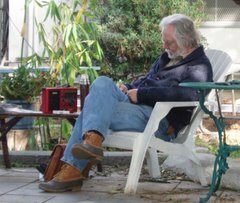 I grow beans almost as an afterthought, because I'm much more caught up in tomatoes, cucumbers and other typical Summer food fare. My favorites are yellow and purple beans. The purple beans because they will germinate in cool, wet soil (other beans will have poor germination, if they sprout at all, and will not produce much earlier than if you had waited - unless, of course you put down row covers or do other ground warming techniques). The yellow beans are a delight for pickling, I've pickled them for years, the yellow beans make a lovely visual in the jar and on sandwiches or in salads. Walking by the plot, I realized there was a tremendous number of beans on these plants! It was, by any standards, an impressive crop! 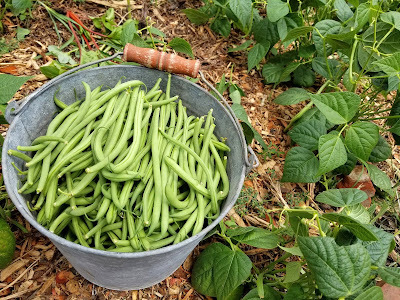 I came back later in the day and, leaving behind a number of beans that were not yet up to size, I filled my old bucket in no time at all. I learned from Renee Shepherd - the Renee in "Renee's Seeds" that these beans are an heirloom bean that has been around for more than 30 years - being a selection of an old Dutch variety called Slankette. They are crisp and sweet and would be delightful steamed with a pinch of salt, pepper and a little butter. They are great raw! But they would be a tough sell for pickling because they are a slender bean and packing would be more difficult. Which is why I'm canvassing my neighborhood for folks who would eat a gallon or so of green beans! The beans on these plants are very easy to see and pick. With some bean varieties, you must pick them from two different directions to find the beans and even then, when you next pick you'll still see beans you missed from the last picking (another reason I like the purple and yellow beans - you can actually see them). These are not hard to find as well, even though they are green, the beans are in clusters and easily seen and harvested. This was only the first picking and I purposely did not pick beans that were not up to size and so there are a lot of beans I'll be picking tomorrow! In addition, there were still a lot of flowers in bloom, so these three gallons may well be the first go round. I'd give Slenderette Bush Beans an A+ for flavor and productivity. I'd recommend you try them - especially if you are short on space! They are a fast growing variety, which means you ought to easily get more than just one planting of them in our long summers.